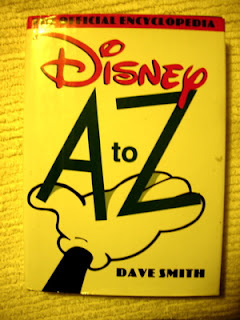 This is the first edition of the book, "Disney A to Z" by Dave Smith, the head of the Disney Archives in Burbank, California. This book contains information about almost everything you always wanted to know about Disney- from the man Walt Disney himself, to every movie that The Walt Disney Company has made, right up to the date that the book was published. This book has already been updated at least a couple of times since the first edition. It is a must-have book for any major Disney fan. If you are looking for a good gift to give a Disney person, this book is indispensible (your friend might already have it).